 PFAS can accumulate in the game species we harvest, the fish we catch, and the fruits and vegetables we grow. In southeast Michigan, however, it’s still unclear how fast and to what extent PFAS builds up in the types of food we eat. Hunters concerned about PFAS in the game they harvest can have meat tested by three labs (known as of 11/14/18): Vista Analytical Laboratory, Battelle and GEL Laboratories. Toxic PFAS chemicals accumulate in fish and game. 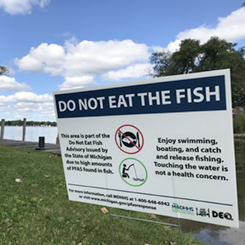 In the Huron River, PFAS has contaminated fish and the State issued a Do Not Eat Fish Advisory extending from Milford to Lake Erie. The DNR found that PFAS was in a deer that resided near a contaminated marsh in Oscoda Township near the Au Sable River and issued an advisory to avoid consuming deer taken from the area. Australian officials found PFAS in ducks that frequented a contaminated water body and banned hunting the birds near the wetland. Fruit and vegetables grown in PFAS-contaminated soil or irrigated with polluted water can also absorb the toxins. Near Parchment, Michigan, garden foods went unused after PFAS was found in the groundwater supplies. These cases show us that PFAS do contaminate game and homegrown foods, but we still don’t fully understand how or how fast PFAS accumulates in different plants and animals. It’s complicated. No species is the same, and collecting reliable, representative animal samples from a given location is difficult. It’s additionally challenging to determine what level of PFAS is safe for human consumption. PFAS in food could also impact local economies. Hunting and fishing constitute a multi-billion dollar industry in Michigan. Rural communities across the state often rely heavily on game and gardens for their sustenance and livelihood. Hunters, anglers and an expanding group of garden-to-table food producers put food on plates and drive local revenue. The long term impact of fishing restrictions will also hit parks budgets by reducing the number of visitors they see. Fewer visitors means fewer funds for maintenance and park improvements. In higher population density areas like southeast Michigan, hunting opportunities may be limited, but deer and other game populations are managed to improve ecosystems, and the meat is often donated to charity. It’s possible that animals harvested for donation near the Upper Huron River could contain PFAS, given that such high levels of the contaminant were detected and some deer are known to reside near those contaminated areas. We just don’t know what the actual level of risk is for sure because there are few labs that test game species. That bottleneck could put municipalities, organizations, and hunters that donate to charity in a tough spot. Is it better to play it safe and abstain from giving potentially affected meat to charity even if there is not yet any evidence of contamination? It’s a question several groups across the state will have to answer this season. State and federal agencies need to provide clear guidelines for how to reduce PFAS contamination from food and how to reduce human consumption of food already contaminated. They need to give guidance on how to collect and test samples and timely access to labs that can reliably process collected samples. Providing that support will likely take additional resources. Our legislators can help. They can stand up for the health of Michigan residents who eat what our woods, waters, and soils provide. Hunters, anglers, and gardeners can help protect themselves by staying aware of current health advisories regarding fish and game, having meat tested if they wish, and should only irrigate fruits and vegetables with clean water from wells or municipal sources. We will continue to update our PFAS webpage as we learn more. You can find it here.